Anyone owning a pre-JK 4-door Jeep Wrangler knows the value of space. Cramming a tent, sleeping bags, coolers, and gear into the limited footage of a Wrangler always feels like a game of Tetris. Add gear like tools (it is a Jeep), a hi-lift jack, shovel, and a few extra gallons of fuel and it is no wonder that there are a seemingly uncountable number of available aftermarket parts. Packing gasoline next to my wife’s clothes and bedding always felt like playing russian roulette so I was very excited when a pair of two gallon Rotopax containers were delivered. Rotopax is a slick modular storage system for fuel, water, first aid, and even a general storage container with a variety of mounting options. My first impression was that they are very well built. The tanks felt rugged and durable, nothing like the transparently-thin walls of the containers I’ve packed in the past next to my wife’s sleeping bag. Their website explains rotational molding and permeability barriers, but no explanation is needed after handling one of their tanks, these things are tough. Along with the tanks and the standard mounting hardware, I also had the universal mount as an option for mounting to my roof rack. They definitely meant universal when they designed the universal mount. With so many possible mounting options, it took longer to decide how and where to mount it than it did to actually install the hardware. The mounting was very simple and quick and in under 20 minutes they were ready to go. The mount is very solid and the powder coated steel plate held the packs so tightly that I’m sure my rack would break before anything on the Rotopax would fail. The mounting t-handles are ingenious. We tested the DLX mounts, which has two wing handles per mount as opposed to one. The first handle has divots to snap onto corresponding bumps on the packs, the second applies final tension and snaps into the first wing to holds the entire pack securely in place. I’m always nervous about strapping items to my roof where they are out of sight and could potentially fall off without my knowledge, but I don’t feel like I need to worry about losing the Rotopax. In addition to the universal and standard mounts, Rotopax makes many vehicle and ATV/UTV specific mounts. If they don’t have one to meet your particular needs, aftermarket Rotopax mounts are everywhere. 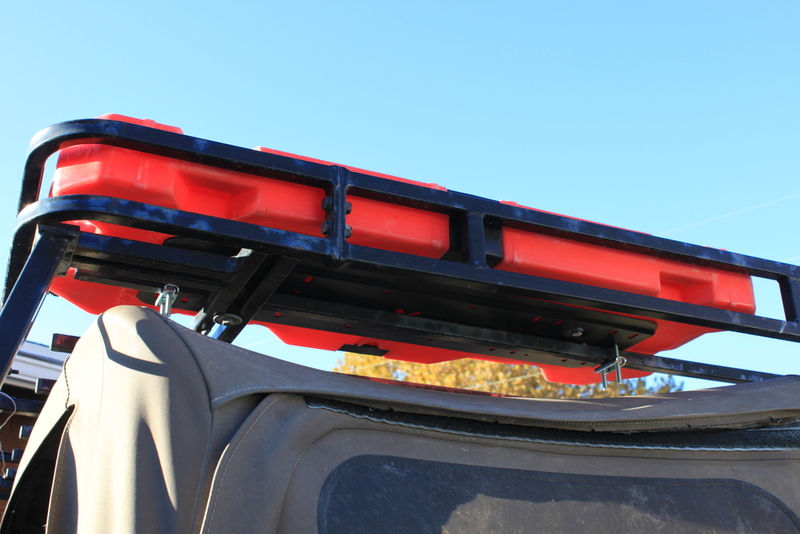 If you have an idea of where to mount these, chances are someone has thought of it and is making it already, including, roll bar interior mounts, bumper mounts, spare tire mounts (side and wheel), and roof rack manufacturer direct options. I was very happy with the Rotopax and do not see any flaws in the system. If you are super organized and want to mount them on the wall like this, it will cost $29.95 per mount. Personally, I will just hang them on a nail. Everything is well built, from the mounts to the tanks themselves. I’ve had a lot of comments on them and my family has been blunt about what they want for Christmas. I’m also considering extending the packs to add water tanks to my existing setup. They are pricey — this setup comes in at $253.75, not cheap for fuel storage, but far cheaper than a swing away tire mount bumper with jerry can mounts. On a side note, I opted on an alternative mount. Flipping the universal plate upside down, the plate fit snugly and securely between my slightly adjusted roof rack stringers. The universal plate was mounted on the underside of my rack stringers while the tank was mounted on the topside. Tightening the t-handle wings pinched the stringers between the plate and the fuel pack which created snug mount that has given me no issues and requires no tools to install this way. The tanks are now riding directly on the roof rack. The only potential issue I see with this mount is that the tanks themselves now provide structural support and rubbage may occur directly to the tank. It takes just a few minutes to mount the fuel packs this way and all of the hardware comes off with the tanks leaving the rack bare when not needing to carry extra fuel, which I prefer. This mount also required longer bolts because the bolt head pockets are now reversed, extending the distance from the plate to the upright base.